In less than a month, a record-breaking number of delegates of the 66th Annual Miss Universe Pageant will start arriving in Las Vegas. Despite the unfortunate incident that happened in the same city earlier this month, Miss Universe promises to be bigger and more exciting than ever. No amount of fear will dampen the American spirit, and the show will definitely go on! The one to beat! Thailand’s Maria Poonlertlarp is our current top pick! 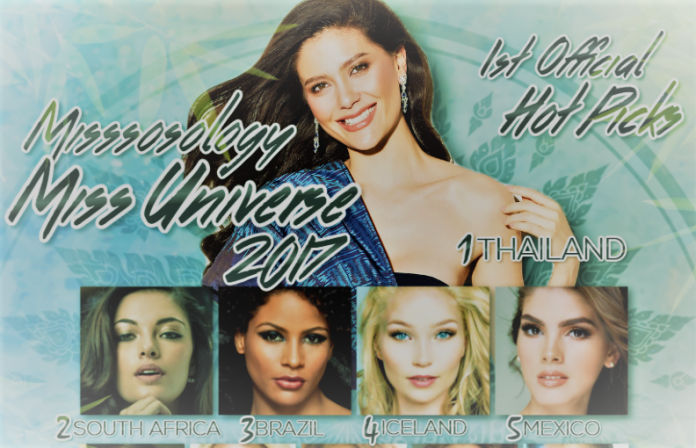 Topping the list in our first ever hot picks is Miss Thailand, Maria Lynn Ehren (Maria Poonlertlarp), or simply Maria. This major charmer won the most prestigious pageant in Thailand last July, which was covered by Missosology’s Bong Tan. Many would agree that Maria is probably the most recognized Thai beauty in recent years, thanks to the amazing genes of her parents – her mother is Thai-Chinese, while her father is Swedish. Her fluency in English, which is the official language of Miss Universe, will simply provide the missing link that a Thai delegate always lacks in the competition. Her statuesque figure, and amazing height – she stands 6-foot tall – will make her one of the tallest delegates this year. That’s not to say that Maria is just all about external beauty. At 25, she has done quite a few jobs where she was briefly assigned in Rotterdam, Netherlands and then back to her native Thailand. She can speak a little bit of Swedish and Chinese, aside from her native Thai and English. Demi-Leigh Nel-Peters, who is representing South Africa, is following at second place. Actually, Missosology had a difficulty choosing between Demi-Leigh and Maria for the top spot. Maria’s advantage over her was the height factor. In the meantime, this 22-year-old stunner is considered to be the most photogenic delegate this year. What she may lack in height – she is only 5’7″ – she makes up for her amazing beauty. Being Miss South Africa, Demi-Leigh has done a lot of charitable works while representing her organization. Her loads of fans have been very supportive all throughout, and many of them celebrated with joy when Demi-Leigh was to compete at Miss Universe instead of Miss World. It was only three years ago when South Africa won the Miss World crown, but it has been 39 years since they last won the Universe! In third place is Monalysa Alcântara, the 18-year-old stage diva from Brazil! Monalysa will compete at Miss Universe as one of the youngest contestants, and a few among the “teenage” bracket. She made history by being crowned as the second African-Brazilian in a row to win the Miss Brasil title. Last year, her predecessor, Raissa Santana, was a major favorite and was even hyped to death by our website. No one probably expected that Brazil would crown another woman of color to represent them at Miss Universe, but Monalysa was simply unbeatable. Should she win the title, she will be the first teen winner since Zuleika Rivera. Not to be ignored on our list is the sporty goddess from Iceland, Arna Ýr Jónsdóttir. Although she was body shamed last year at a minor pageant, Arna is back with a bang and is expected to rock the stage this November. This pole vaulter and a European bronze medalist will certainly get the nod of the Miss Universe organization, who is always looking for diversity. A beautiful sports athelete from a tiny volcanic island in the middle of Atlantic Ocean just fits the bill! Mexico‘s Denisse Franco completes our top five, and is also considered as the one to look out for in Las Vegas. Expect her loads of fans to cheer for her, as they did in 2010 when Mexico’s very own Ximena Navarette won the crown. This 19-year-old model will carry the banner of her which just recently suffered from a major earthquake that claimed hundreds of lives. Denisse’s youthful vibe and angelic beauty will be her major assets, and we are also confident that her wit and charm can win the hearts of many during the competition. Adar Gandelsman, who was serving the Israel Defense Force, will represent the Jewish state at the Miss Universe pageant, after being declared as 1st Runner-up in the Malkat HaYofi 2017. At sixth place, Adar is one of the most naturally beautiful delegates this year. We actually feel that Israel has been unfairly ignored at beauty pageants in recent years. In fact, the success of Gal Gadot, a contestant at Miss Universe 2004, should be a wake up call to pageant owners that Israel produces some of the most successful Hollywood stars of all time. Following Adar at seventh spot is the blonde bombshell from Australia. 25-year-old Olivia Rogers will avenge last year’s disappointment from the land down under, and will carry the Australian banner with much anticipations from global fans. This green-eyed model is the epitome of an Australian beauty which normally gets the nod of the judges in international pageants. Bubbly, vivacious and blonde, we might be seeing here the third Australian Miss Universe. Colombia‘s Laura Gonzalez is in eighth place and we are confident that her country will keep the placement streak. Since 2014, Colombia has placed in the Top 3, which is a repeat of their three-year 1st Runner-up streak at Miss Universe in the 1990s. Laura speaks like a true beauty queen, and has the intelligence that always comes with being a Señorita Colombia. Aside from that, her stage presence is impeccable so we expect that she will do well in the overall competition. At ninth place, Ksenia Alexandrova is one lucky runner-up! After the winner of Miss Russia 2017 decided to go to Miss World due to conflict of schedule, Ksenia will now be given the chance of a lifetime to represent mother Russia at the Miss Universe contest. A favorite at the highly competitive Miss Russia pageant system, Ksenia is a native of Moscow and will be celebrating her 23rd birthday in Las Vegas. Completing the tough group of Top 10 is Bunga Jelitha of Indonesia. This successful model was the overwhelming winner at this year’s Puteri Indonesia pageant, and is being groomed by a competent team in Jakarta. Indonesia has been doing well in Miss Universe, with an impressive four-year streak in the first cut. Will Bunga be the first to pass the swimsuit stage, and eventually go all the way to the final cut? Rachel Peters of the Philippines is pegged at 11th Place. This may come as a surprise to most of the Filipino supporters who always expect their local bet to be placed high in our hot picks. However, at this point, Rachel has not met our expectations, yet. With nearly a month more to go before she departs for Las Vegas, the Philippines is bound to surprise us once again with a major transformation. The crown-defender, France‘s Alcia Aylies, is currently in 12th place. Just like Iris during the 65th Miss Universe contest, Alicia is low-key. The main reason why she has been the talk of the town is because she is the successor of the current Miss Universe in her national pageant. Beauty-wise, she has a unique exotic charm that can be recognized easily. Meanwhile, Angola‘s Lauriela Martin, is in 13th place. She is the best Angolan delegate since Leila Lopes and we are hoping to see Angola back in the game after a five-year consecutive non-placement at Miss Universe. At 14th Place is Samantha James of Malaysia. She is the fourth Southeast Asian on our list. It cannot be denied that this region has become the cradle of pageantry in recent years. Malaysia may find hope with beautiful Samantha, as she tries to become the second ever Malaysian in history to make the first cut at Miss Universe. Completing our Top 15 hot picks is the exotic delegate from Haiti. Cassandra Chéry is an ebony beauty with a great stage presence and intelligence to boot. After the historical performance oby her predecessor at the previous Miss Universe edition, Cassandra has the pressure of duplicating or even outdo the placement achieved by Raquel Pélissier. Missosology will be very glad to read your wonderful comments as they may affect our analysis for the next hot picks! Share your comments below and let us know how you feel! 5 Secrets Why Philippines always Successful in Pageants?